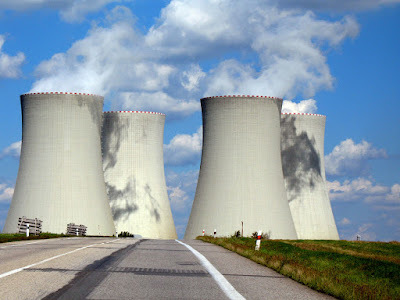 Cooling towers of a nuclear power station. Australian energy consumers are currently in a crisis, receiving some of the highest power bills in the world, making us a prime target for the nuclear energy vultures who claim their industry will bring the cost of electricity down. It's a smoke and mirrors argument when you consider the cost of actually producing electricity isn't the main reason for Australia's ever increasing consumer electricity prices. Hypothetically, even after the cost of installing nuclear power plants, the actual cost reductions won't be as dramatic as the nuclear energy industry would have you believe. According to this article, A high price for policy failure: the ten-year story of spiralling electricity bills by David Blowers, published in January 2018, the two biggest factors are the cost of the network (transporting electricity), and the retailer margins (cost of billing and servicing the customer). These are followed by the wholesale cost (actually generating the power), and the environmental schemes we pay for through our electricity bills. Overall, according to the ACCC we're paying 44% more for electricity than we were ten years ago. Also, according to David's article the cost of the network has increased from $42 billion in 2005 to $72 billion by 2016 (an increase of 70%) despite there being no significant change in the number of customers using the network over that time period. Which means we're actually paying for infrastructure that was built but we didn't actually need (seemingly thanks in part to government incentives that encourage energy companies to build more infrastructure whether we need it or not). Being an energy retailer is big business and, far from competition causing prices to drop, instead companies are spending more and more on marketing and passing those costs along to the very people they're competing for, the consumer. If you've ever wondered about retailer mark ups there's a good comparison in this article by Bulk Energy, Australian electricity prices; the cost of electricity in Australia per kWh, published in June 2018. As you'll see all the markups are pretty high with the highest being South Australia at 383%. Whilst these markups sound ridiculously high they don't necessarily translate into similarly high profit margins. Apparently these markups are essential to cover the cost of running their business. Regardless the point of this post is to highlight that there are faster ways to cut the cost of electricity bills than building nuclear power stations... and to debunk the idea that nuclear is the answer to spiraling costs. Government reforms in the two main key factors could significantly reduce energy costs for consumers without the need to build anything at all (least of all more network infrastructure that we don't need). Apparently it's easier to build things than it is to build good policies. Just look at that massive Tesla Battery the SA government commissioned to keep the lights on (which is, apparently saving the state money). I feel there's a push by Nuclear Energy companies and their supporters to leverage the current crisis, attempting to get their foot in the door to change Australia's ban on nuclear energy. These companies are promising cheaper prices, and still pedalling the line that Nuclear is a 'clean' energy source because it supposedly has zero carbon emissions... which is like saying coal is a clean energy source because it produces zero radioactive waste. It's foolish to swap one toxic power source for another that is equally, if not a more toxic, when there are actual cleaner, safer alternatives. These alternatives may not yet be able to completely takeover from current 'base' power sources but if nuclear gains a foothold here, what incentive will there be to develop renewable energy alternatives to the necessary levels required? Australia will never become a world leader in renewable energy if we fall for the seemingly easy and unnecessary option of nuclear power. There's an argument that by not having nuclear power Australia is being left behind but, with real incentive to develop renewable energy, we're actually positioned to lead the way in making them viable sources of base energy, instead of supplementary. As much as the media and the nuclear industry tries to tell you the fear of a nuclear meltdown is the reason we have a zero tolerance for nuclear power, I believe it's the idea of living near a nuclear waste storage facility that really turns people off. The chance of a meltdown is minimal with only three actual nuclear meltdowns since nuclear power stations became a thing. Living next door to a nuclear waste centre is a fact. Someone has to. The trouble is most Australians don't want to, and the rightful landowners are right to say 'not in our backyard either'. Saying yes to nuclear energy will not reduce the cost of your bill in the short term since it takes time to build nuclear power plants and, realistically, how many would you need to make a dent in prices nationally? By the time they are built our government could have got their finger out and actually created policy reform to bring prices down, and then we'd be stuck with more network infrastructure (i.e. nuclear power plants/waste disposal centres) that we didn't need in the first place and now have to pay for. If you're interested in investigating the issue of Nuclear Energy in Australia further there is a great page on the Parliament of Australia's website that covers much of the history of the issue in this country as well as the pros and cons of using nuclear energy. You can also read my opinion piece on South Australia's investigation into the possibility of setting up a commercial nuclear waste facility in our state that would have potentially stored waste from power plants worldwide. Why Does Everybody Shout in Hospitals?